Last month, we noted that Twitter was testing a “You both follow” feature, showing users you and another user both follow. That’s interesting, but not particularly useful. Today, they’ve begun to roll out a new “Suggestions for You” feature which looks at who you follow, and who the people you follow follow, and suggests new people for you to follow. Yes, just like Facebook does. This is very useful. In fact, this is arguably the most useful social graph feature that Twitter has rolled out yet. A few weeks ago, Twitter rolled out a new name results area for search — which was incredibly helpful for finding celebrities or brands on Twitter. But this is better. This is all about finding people you may actually be interested in based on your current social graph, but for whatever reason, haven’t connected with yet. Such a feature would be less interesting if it were only tucked away in the “Find People” area of the site. But Twitter is actually going to put it front and center too. When you click on other users’ profiles, you’ll see a “Who to follow” area in their profile space to show similar users that you might be interested in. 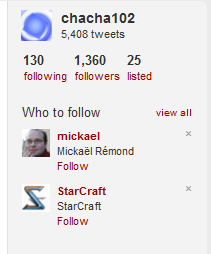 And when you follow someone, you’ll get other suggestions based on that follow as well. 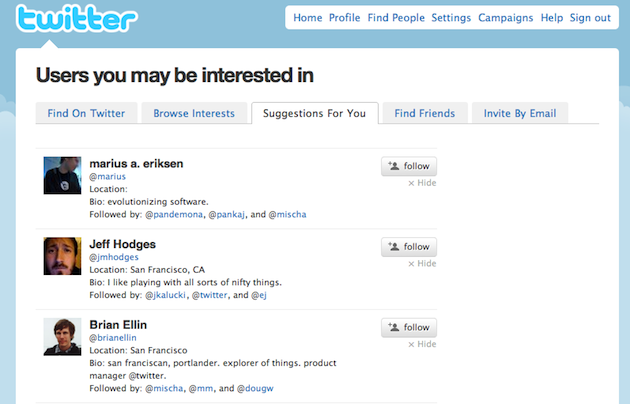 The algorithms in this feature, built by our user relevance team, suggest people you don’t currently follow that you may find interesting. The suggestions are based on several factors, including people you follow and the people they follow.